Twitter is a very open and active social network. As a small business owner, it may be difficult to sort through all of the chatter on Twitter and focus on those who will make an impact on your business. As a Social Media Coach, I speak with a large number of small business owners on a daily basis. I often get asked, “what is the best way to organize my Twitter feed?” And I always point them in the direction of using Twitter Lists. The Twitter Lists feature is a way to organize the people you are following (or not yet following) on Twitter in preferred groupings. Lists offer a way to see updates from specific people you have decided to focus your attention on. These lists are not just a listing of selected Twitter profiles, but rather a curated stream of members’ most recent tweets. From the Gear Button – located in the top right corner of the page, a drop down menu will show your “Lists” option. From the Sent Tweets Page – You can get to your sent tweets by clicking on your profile picture from the top left side of the navigation panel. Once on that page, you will see “More” located next to the button for your Favorite Tweets. By clicking on “More”, a drop down menu will give you the option to click on “Lists”. Once on the “Lists” page, you can create a new list by simply clicking on the “Create new list” button found on the right side of the page. After clicking on the “Create new list” button, a pop up window will open where you can enter your list details. This is where you will provide the name for your list, a description, and whether you want your list to be Public or Private. It is important to note that a list that is public can be seen and followed by anyone. A private list is only accessible and seen by you. You can add members from any individual profile page by clicking on the gear button next to the “follow” button. Or you can add members by going to your own or anyone’s “following” or “followers” links and clicking on the gear button. Note: You can add members to more than one list. Manage list settings by creating a title, adding a description (optional), and setting the List to either public or private. 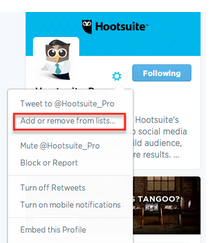 (Please note that the same rules for privacy settings apply on the Hootsuite dashboard as they do in Twitter. Public lists can be seen by anyone and private lists are exclusive to your account). Whether you are selecting a list that was previously made or creating a new one, the given stream will only show updates from the members of the list you have selected. 1. From contacts page: From the navigation panel, on the left hand side of the dashboard, you can find your Contacts Page. There you can find all of the Twitter Lists that are associated with your Twitter accounts. You also can see all of the people you follow and those who are following you. To add any of these people into your Lists, you can just drag and drop them directly into your Lists. 2. 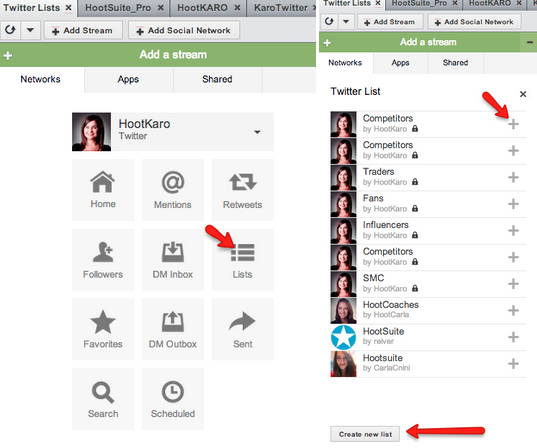 From streams: To quickly add or remove users from a Twitter List, open the drop-down menu at the top of your List stream and click “Preferences”. From there you will be able to add Twitter users to the List just by typing their username. You will also be able to explore the List and remove any users you no longer want on the List. 3. 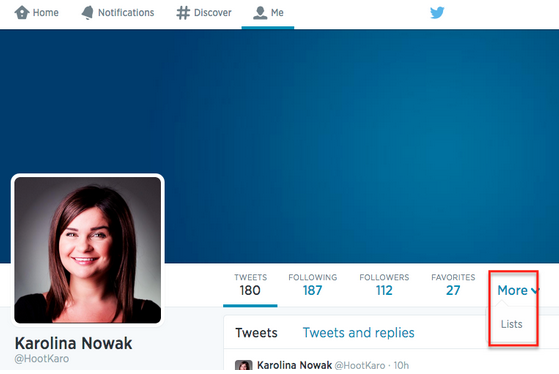 From user profiles: You can view any Twitter user’s profile by clicking on their Twitter name. Once doing so, a snapshot of their profile opens. From there, you can click on the “add to list” button found at the bottom of the profile snapshot. Whether you have 50 followers or 50,000, you can use Twitter lists to organize those followers based on any grouping method you want. For example, if you are a small business owner, you can create a list that includes all of your customers. Your Twitter feed can sometimes seem like an endless pit of updates, because quite frankly, it is. 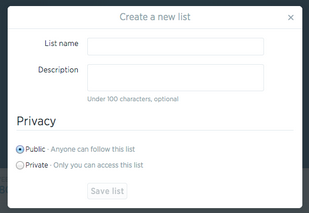 Creating Twitter lists allow for a quick and easy way to catch up with those updates you actually want to monitor. You can simply click on the list you want to view, and scroll through its members’ updates any time you want to catch up. Whenever you add someone new to a public list, they will get a notification letting them know you have done so. This is a great way to increase your visibility with Twitter users who you do not follow. For example, if you add someone to an ‘Influencers’ list, they may come back and thank you with a follow. The beauty of Twitter is that it is very transparent. You can create lists of people you find influential in your industry or thought leaders within your own company. These lists can be a way to show off your employees or network of awesome followers. When making your lists, one important setting to remember is the Public vs Private setting for each list. Setting the list to Private can give you an advantage over your competitors. You can keep tabs on all of your competitors’ tweets without them ever knowing. This will come in handy whether you are doing a social media audit, comparing promotions, or just making sure you stay one step ahead of the other guy. If you are managing multiple clients, grouping them in a private list is also recommended. The last thing you want is to have your clients feel like you have a watchful eye on their every move. It is important to monitor these client profiles, but under the discretion of your social media management team. An added bonus to Twitter Lists is that not only can you create your own, but you can subscribe to other people’s public lists. Find brands and individuals you find influential and check out their Twitter Lists. If the group of users seem like a fit, subscribe to the list. This is a great way to view what key influencers are saying without having to follow them. You can also see which lists your competitors are subscribed to. This will give you an advantage by making sure you are also keeping an eye on the same users your competitors may be looking to for inspiration. Do you have awesome Twitter lists that you follow? What are some of your best Twitter List best practices? Share them with us in the comments! 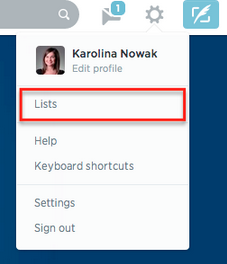 Start managing your Twitter Lists with Hootsuite Pro! Karolina is a Hootsuite Social Media Coach educating users on how to maximize the Hootsuite Dashboard when executing their social media strategy.